In vajrayana, one is consistently encouraged to regard your guru as buddha, particularly in the context of guru yoga. In fact, the practice instructions are to imagine your teacher in the form of a buddha, i.e., Buddha Vajradhara in the Kagyu tradition. What does this instruction mean? How is it to be understood? I think it is fair to say that more than a few Western practitioners have puzzled over this matter. Does it mean that your guru is omniscient, infallible, perfect, etc.? Or does it mean that you regard your guru as omniscient, infallible, perfect, etc.? Such questions lead to a more fundamental question. "What is a buddha?" Is a buddha omniscient, infallible, perfect, etc.? Certainly, in the Tibetan tradition at least, a literal reading of sutras, tantras and other texts leaves one with the impression that a buddha is a superhuman figure with superhuman abilities. Are you to feel or think that your guru has these abilities, too? the nature of vajrayana practice. Do not trust the person; trust the teaching. Do not trust the words; trust the meaning. Do not trust the literal meaning; trust the real meaning. Do not trust conceptual knowing; trust timeless awareness. Even these instructions are prone to misunderstanding. For instance, if you have no experience of timeless awareness, then how do you trust it? Or, what does the phrasereal meaning mean? This is a translation of the Tibetan phrase nges.don, literallydefinitive meaning. One could also say actual meaning, I suppose, but the problem remains: who decides what the actual meaning is? Verses such as these contain both implicit and explicit messages. Because we are so used to literal interpretations in our culture, we often miss the implicit messages. One message imbedded in these four lines is that they describe a progression in practice experience. Thus, the 3rd and 4th lines are intended not for people who are just beginning practice, but for people who have a good bit of practice experience under their belt. You start by trusting your teacher. You have to. People may start Buddhist practice or meditation practice by reading, etc., but, for the vast majority of people, practice doesn't start in earnest until they begin to work with another person. One of the main reasons is that it is quite difficult to give yourself the appropriate feedback about your efforts in practice and how to refine them. People usually find that their meditation practice changes substantially when they start reporting their experience to a teacher and receive feedback and guidance based on their experience. So that's where you start. In the context of vajrayana, for instance, one principle is to obey your guru. However, that principle applies only to the practice instructions your guru gives you, not to what you do with your life, though many people are not clear about this. Your teacher may have ideas about what you should do and you may even ask for advice, but it's your responsibility, and yours alone, to decide what course you take. This was brought home to me when I talked with a respected Tibetan teacher about decisions I had made about teaching in Los Angeles. He said, "Ken, how you teach your students is up to you, not Kalu Rinpoche." He said this not out of any disrespect for Kalu Rinpoche, as he had also studied with him, but to make clear to me where the responsibilities lay. Do not give up the dharma "through fear." For example, someone may come up to you and say, "If you do not give up the dharma I will order three hundred soldiers to cut five ounces of meat from your body every day." Even then you would not give up the dharma. When I taught this passage many years ago, the people in the class couldn't relate to it. Even if it was translated into modern idiom, that you were going to be tortured if you didn't give up the dharma, that situation was so removed from their lives that they just dismissed the example as having any relevance to them. But then I asked, "How many of you have faced those three hundred soldiers in your meditation?" Everybody in the class immediately related to Gampopa's instructions because, in their meditation, they had encountered those three hundred soldiers countless times. The third line continues this theme and describes even more explicitly how to understand teachings, whether oral or written. 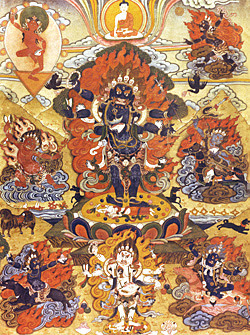 The myths that describe the origin of the protector the Six-Armed Mahakala (pg. 295-6 in Wake Up to Your Life) or Vajrakila are dramatic accounts of deep internal spiritual processes, as are the myths of the second-coming, the resurrection, Abraham and Isaac, Job, etc. The meaning of such myths becomes alive in you only when you have experiences that correspond to the shifts and experiences that gave rise to the myths in the first place. And that brings us to the fourth line, which makes a strong differentiation between a conceptual understanding of a teaching, whether through myth, poetry or otherwise, and direct or experiential understanding, that is, when what is being described becomes lived experience. For instance, Trungpa once described the experience of compassion as "having no skin". Everyone can understand that, and even get a bit of the flavor, but it's still in the conceptual mind. When you experience compassion yourself, it is intensely yet exquisitely painful. It is so intense that you wonder how you can bear it. It is like having no skin, yet you wouldn't forfeit it for the world because, and I hesitate to use these words, it is so real and true. This exploration caused something to dawn for me, along the lines of connecting with the teachings. In the description of the 300 soldiers in meditation, it really struck me now hard it is to sit sometimes. I suddenly felt a sense of connection with other meditators, all on the cushion, trying to actualize bringing benefit to the world. It seems I find blind corners and unexamined beliefs, sometimes indifference, along with sometimes the warmth of compassion when I reflect. Other people have found similar things, and faced their 300 soldiers, and I feel heartened that they have been at it for what must be significant amount of time. This new usage of my creative faculty to understand the trials of others feels very beneficial. What I initially wanted to write about was the shift that Ken described in this passage, where people suddenly related to the simile in a meaningful way for themselves. I think a similar shift occurred for me in a different place in my mindstream. I realize I have been trying to extract meaning while divorcing myself from the basic principle of cultivating Bodhicitta. I see a pattern in my attempts to bring the teachings to the real world where I have been doing this in many places. It seems to me I need to refocus my efforts away from understanding the words to actualizing the meaning. The meaning lies there, waiting to be comprehended, while I go about shopping, and doing errands, divorced from what is true about nature of shared experience.